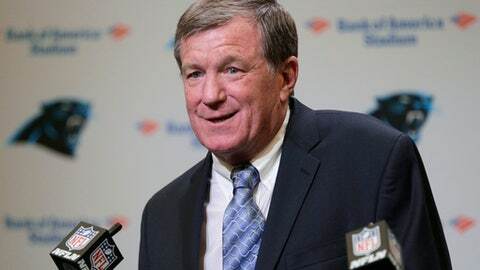 Marty Hurney will be calling the shots once again with the Carolina Panthers. Carolina re-hired Hurney as its general manager on Wednesday, marking his second full-time stint as general manager. Hurney previously worked for the Panthers from 1998-2012, beginning as GM in 2002. He rejoined the Panthers last July as on an interim basis. Panthers COO Tina Becker said Hurney did an ”exceptional” job in helping the Panthers to an 11-5 season last year. The Panthers reinstated Hurney as interim general manager last week after an NFL investigation found no wrongdoing into charges of harassment by his ex-wife. Hurney had been on a paid leave of absence during the investigation and had disputed all accusations through his attorney. Hurney returned to the Panthers in an interim capacity in late July 2017, prior to the start of training camp after owner Jerry Richardson abruptly fired Dave Gettleman. Gettleman had served as the team’s general manager since 2013 and had helped the Panthers get to the playoffs three times in four seasons behind a team that Hurney largely constructed. He said he’s excited to be in charge of personnel decisions in Carolina. The Panthers made three playoff appearances, won two NFC South titles, and played in two NFC Championship games and a Super Bowl under Hurney during his first tenure. His last two first-round draft choices as general manager – quarterback Cam Newton and linebacker Luke Kuechly – both won NFL Rookie of the Year honors. Newton went on to become the league’s MVP in 2015 leading the Panthers to a 17-2 season, while Kuechly was named NFL Defensive Player of the Year in his second season. Hurney also traded for tight end Greg Olsen and hit home runs on draft picks like center Ryan Kalil. He also made a few mistakes along the way, including overpaying to keep some veteran players and trading up to get wide receiver Armanti Edwards from Appalachian State, a move that never panned out. The Panthers went 11-5 last season with Hurney as their interim general manager, but lost in the wild card round of the playoffs to the New Orleans Saints.